The oil crash has had a broad impact on corporate America. Oil companies have been defaulting on their debts, and personal default rates for things like mortgages and car loans are jumping in the oil patch. That has started infecting other areas of the economy, with companies from multiple industries citing pain in the oil patch. There is another longer-term problem looming on the horizon for oil companies, according to Citigroup: pensions. In a note out Monday, Tobias M. Levkovich and his team took a look at pension pressure in the US. To recap, there was a $376.6 billion shortfall between pension fund assets and pension obligations in corporate America in 2015. That is down slightly from 2014, but the gap still represents a significant problem. 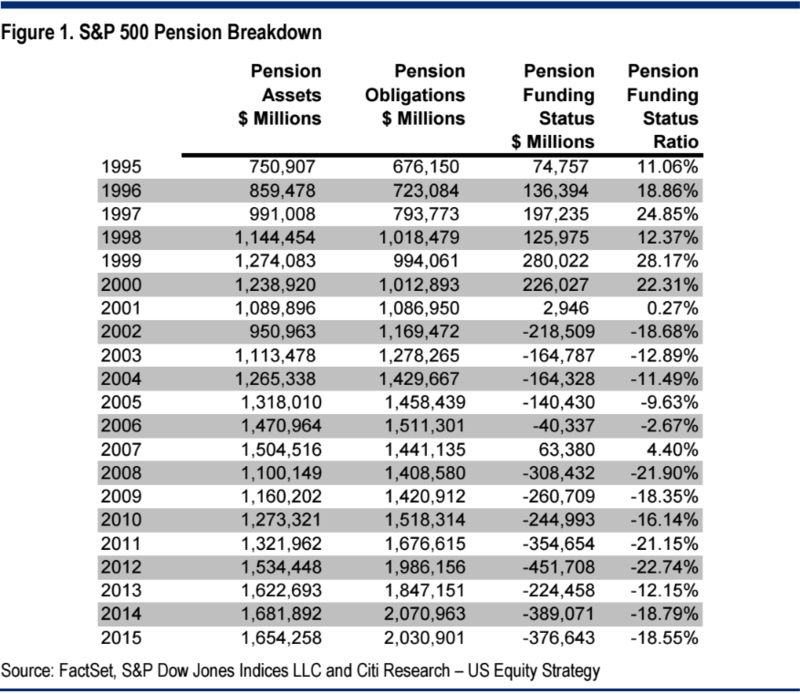 "Pension under-funding continues to be a major issue for S&P 500 constituents as very respectable equity market gains over the last seven years have not substantially alleviated pension pressures. The S&P 500 has appreciated by more than 200% at the end of 2015 since the low in March 2009 but the aggregate underfunded status of $376 billion in December 2015 is now 22% higher than the $308 billion under-funding peak seen in December 2008." "All ten S&P 500 sectors remain underfunded, with Energy continuing to be the least funded sector. As the overall S&P 500 pension funding status ticked up slightly, it is worth noting that only 30 companies within the S&P 500 were fully funded at year-end 2015, with nearly half of the overfunded companies coming from the Financials sector."